How do you develop a customer obsession culture within your organisation ? Why do we organise this masterclass ? What makes Amazon, Google, Facebook and Slack so successful? Is it because they have amazing technology? Yes, partly. Is it because they have massive resources? Not really. Facebook and Google were founded by students, and most successful digital companies rose to prominence taking on much bigger and better resourced competitors. The answer is Culture. Culture was absolutely critical to their success. A culture that was often radically different to the culture of traditional, physical-bound organisations. What is the right culture? And how do you nurture it in your organisation? Our speaker Gerry McGovern has spent twenty years understanding and formalizing the components of a successful digital culture. His Top Tasks methods have been used by organisations such as Google, Dropbox, Toyota, GOV.UK, Microsoft, IBM, Cisco. He has spoken and consulted in 35 countries, and a lot of his ideas on a successful digital culture can be found in his latest book "Transform", that you get with your masterclass participation. The short answer to what is the right culture is: customer obsession. It's not enough to be customer-focused today. You must be customer obsessed. Because that's the way Amazon, Google and Facebook think and operate. And, yes, they are your real competitors. Your customers' expectations are sky high and getting higher. They judge buying something online based on how they buy from Amazon. They judge searching for stuff based on how they search with Google. Your digital presence might be right in line with your competitors but totally out-of-sync with sky-rocketing customer expectations. Who should attend this masterclass ? This masterclass is targeted at managers of digital teams, customer experience and content professionals, online marketeers, but everyone who is interested in digital leadership or involved in digital transformation will benefit from this masterclass. 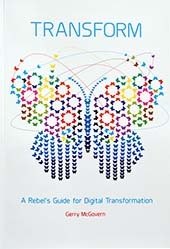 Participants of this masterclass also get a free, signed copy of Gerry's latest book "Transform: The Rebel's Guide for Digital Transformation".